Bernie Sanders and the strange issue of the tooth. Lots of Trump and who is urging surveillance of mosques? Heh, an establishment Republican if ever there was one. Much more on this Sunday talk show extravaganza. 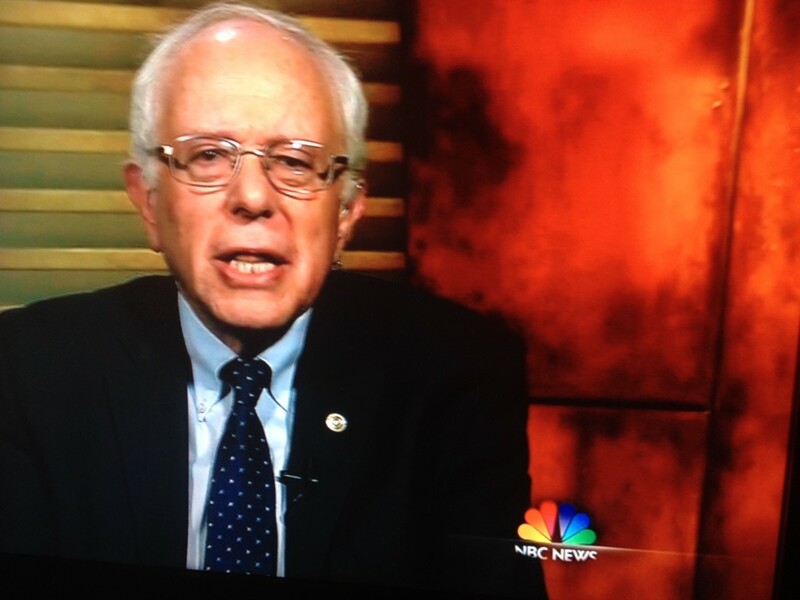 MEET THE PRESS (NBC): Democratic presidential candidate Bernie Sanders. FACE THE NATION (CBS): Democratic presidential candidate Bernie Sanders, Republican presidential candidate Ben Carson. THIS WEEK (ABC): Republican presidential candidate John Kasich, Supreme Court Justice Stephen Breyer. 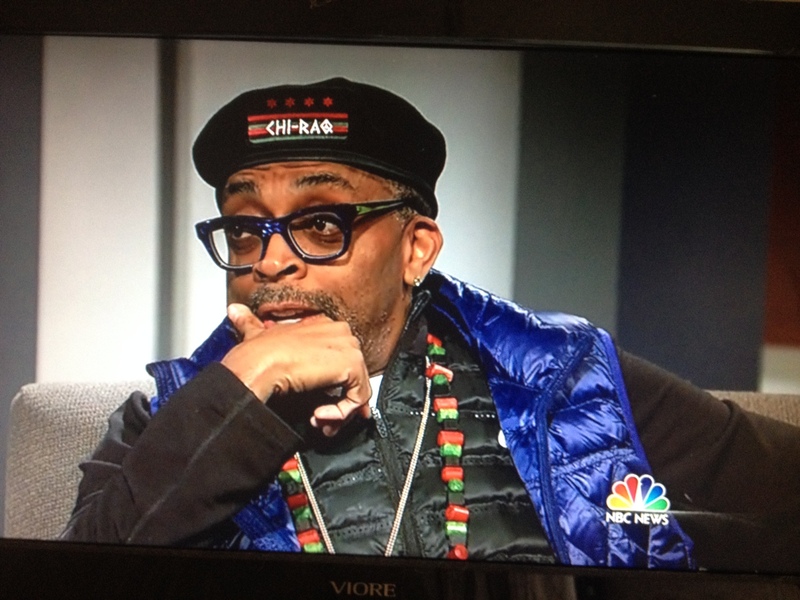 Let us begin by laughing at wonderful political pundit, Spike Lee, and his quest to relieve us of our guns. Seems he has some kind of movie to promote and we should not worry about being shot up while we watch it. Next, heh….remember you read it here first. For here is Democratic presidential candidate Bernie Sanders and…WHAT THE HELL IS THAT IN HIS TEETH? I checked other pics of Sanders, yon reader may do so as well. He has no flaw in his teeth causing that black spot thus I assume, heh, that it’s some kind of food particle. I knew that Ben Carson was taking his perceived lack of experience in foreign policy by presenting his plan for America to take over….say what? Libya? Carson recounted the strategy to be used in such an action, that Libya is close to the Mideast then is easily reachable by Africa below it. It wasn’t that Carson was wrong with his plan, it’s just that it was so esoteric that yon average viewer, like myself, saw right through it. Carson got tutored and was up all night learning. The major memorable thing about CNN’s Late Edition this week was the Democrat on their round table so graciously offering his advice for a winning Republican ticket. Get this….Marco Rubio for President and John Kasich for VP. 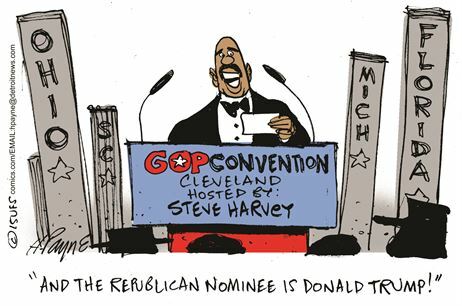 Now Republicans know who NOT to nominate. Guess who’s on the Sunday political talk shows and urging government surveillance of mosques? Indeed, none other than Peter King, congress critter from New York and very much a member of the GOP establishment. Seems things look different when you’re the target of terror attacks. King espoused a close watch on NY Mosques because…..well seems terrorism is promoted in those mosques. Donald Trump managed to get a take in every political talk show and not much new here. His poll ratings remain high and the political pundits, especially the liberal ones, are going crazy. Next week will be a new year so let us bid this one adieu and may every political junkee’s wish come true, LET’S HAVE AN ELECTION! Happy New Year to yon readers and rule of thumb, don’t do anything I wouldn’t do. 24 Comments on "The National Scene-The Sunday Political Talk Show Report on 12/27/15"
Sanders is going nowhere. He fits-in in Vermont because there is no business there other than Starbucks, cheese makers and ski resorts. New York City expatriots living in Burlington account for a voting block that overwhelms the rural areas. Sanders simply doesn’t sell in mainstream America. There is a candidate who will appeal to blue-collar Democrats- Donald Trump. After eight years of Obama (and by inference, Hillary), white workers are tired of being attacked as ‘racist,’ and they’re tired of seeing the labor force being diluted by illegals who work for pennies on the dollar. And despite BO’s claims about ‘saving’ the economy, people working in the real world know that the economy stinks. Obama and Hillary’s bungled Middle East policy exacerbates the situation. So, on social issues, immigration, the economy and foreign policy, Hillary and the Socialist-Democrats have a record that is incompatible with blue-collar workers. Sure, union fat cats will want to maintain the status quo, but don’t look for the rank-and-file to hold their nose and vote as they’re told this time around. Nixon and Reagan carried blue-collar voters, and as a man who has created thousands of good-paying union jobs, so will Trump. 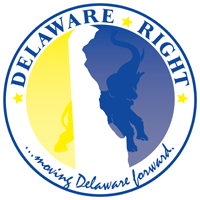 DuPont cutting what, 1500 Delaware jobs? That’s okay, Omaba and Markell are “creating” plenty of opportunities in fast food. The president and governor do not make staffing decisions at Dupont. But they do create the business climate. And they’ve failed. Of course, there’s still plenty of openings in fast food. To believe any two people can “create the business climate” affecting a global enterprise is kinda simple-minded, don’t ya think?. To believe any two people can “create the business climate” affecting a global enterprise is kinda simple-minded, don’t ya think? Obama, as chief executive of the United States, and his administration, set regulatory, labor and trade policies that affect business. And the results are meager- the economy basically stinks. And if Obama doesn’t influence the economy- and thus, business- why is he always boasting about the “great” job he has done? What is “simple-minded” is to put a radical community organizer who never ran as much as a popcorn stand into the White House. If you actually knew how and which “regulatory, labor and trade policies” caused Dupont to layoff 1500 people, you would have mentioned some. There would be too many to cite. Regulatory, labor and trade policies- and tax policies- must be considered by business as operating expenses. Unlike government, corporations must make money to stay operational. Regulations, etc., taxes, wages, sales and profit and so forth all fall under the umbrella of “the economy.” And under Obama and Markell- despite the cheery rhetoric- stinks. Everyone in America can see it, including DuPont. Behold the “conservative” mind; full of big claims, devoid of any supporting facts. 1,700 – and those are people employed directly by DuPont. There are a lot more contractors that DuPont hires through staffing agencies. But the notion that this is due to some “economic policy” or “regulation” takes a special kind of ignorance about why these layoffs are happening. It’s the merger with Dow. The ‘job creators’ have decided that by combining Dow and DuPont, consolidating core businesses, and then breaking that up into three different companies, they will make a pile of cash. This is called “pursuing opportunity”, Rick, and that’s exactly why the combined Dow/DuPont is first going to get rid of a boatload of bottom feeders who are redundant. The combined Dow/DuPont doesn’t need two HR departments, so one of them gets the axe. Expenses are cut, efficiencies are obtained, and the ‘job creators’ get more money without the drag of deadweight employees. This is a consequence of less regulation, not more. DuPont was previously split into several chemical companies through the anti-trust laws several decades ago. The government doesn’t intervene a whole lot in these kinds of mergers anymore, which provides these kinds of opportunities for the extremely wealthy to squeeze more juice out of larger oranges. The idea that this is happening because of some kind of “regulation” that Rick can’t identify, flies in the face of the stated reasons for why they are doing this. You’d think that if this invisible “regulation” was the reason for this happening, then DuPont and its shareholders would be making a lot of noise about this regulation Rick can’t identify. But Rick is either completely ignorant that this is a re-structuring to trim off redundancies as the merger goes forward, or he lives in some other reality in which management and the board haven’t been perfectly clear why this is happening. It’s about opportunity for the Mitt Romney breed of capitalists, and nobody else. In 2014, DuPont paid out $4 billion in profits to shareholders. They are not losing money. They have decided they can make more by combining with Dow and chucking employees overboard who are made redundant by the merger. Those “costs” that they are saving don’t have anything to do with “regulation” or “economic policy”, Rick. Believe it or not, public companies publish all their financial information. DuPont has been a profitable company, but the major shareholders have realized they can make more in the merger. It’s the “economic climate” which has provided the opportunity for them to make even MORE money. You seem to have this backwards, Rick. A corporation doesn’t exist to employ people for salaries and wages. It exists to turn a profit for the shareholders. And 2016 is going to be a very good year for the shareholders. That’s hardly a dismal “economic climate”. Because you are not part of the owner class, Rick, it’s understandable why you see the shedding of these expendable nobodies as a bad thing. What a bunch of nonsense. Regulations and government’s economic policy affect all businesses and are an integral part of profit/loss, and thus, of long-term business strategy. You sound just like clueless Obama, who never ran as much as a lemonade stand in his life. I’m pretty sure the DuPont board and management, along with the accountants responsible for writing the annual reports have a pretty good handle on the company’s financial situation. So, they’re all lying about he the merger, is that it, Rick?